Did “Superstorm” Sandy Supercharge Short-Term Timber REIT Returns? On October 29th, 2012, Hurricane Sandy – crowned “Superstorm Sandy” by the media – landed on the East Coast of the United States, disrupting businesses from North Carolina to Maine and west to Michigan and Wisconsin, with concentrated damage in the Northeast. According to The Wall Street Journal, initial estimates of the insurable losses exceeded $15 billion with total damages falling between $30 and $50 billion (“Sandy’s insured-loss tab: up to $20 billion”, 11/2/2012). 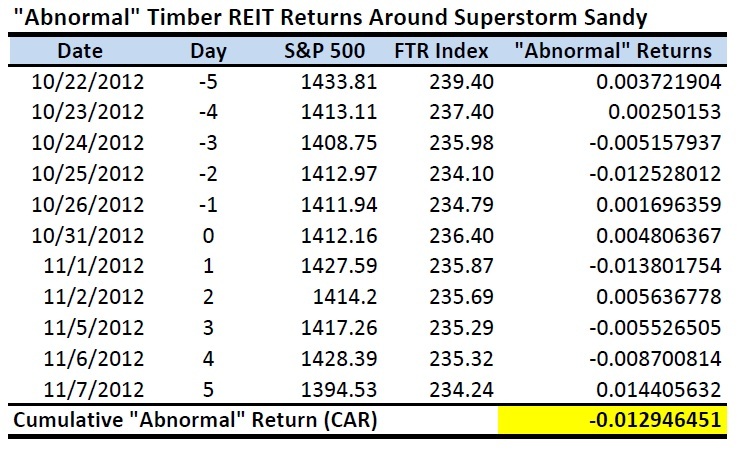 In response to multiple questions from investors and reporters about the potential effects on timber stocks, I conducted a simple “event study” to see if, in the short-term, we observed statistically “abnormal” moves in timber REIT stocks immediately before or after Sandy. There was this other “event” occurring around the same time: a U.S. Presidential Election. History suggests Presidential Elections affect trading activity, too…. Pure manufacturers of building products, such as lumber and OSB, may show more direct effects in this type of post-catastrophe environment. We used a simple regression to estimate the relationship between returns from the S&P 500, which represents the overall market, and the Forisk Timber REIT (FTR) Index, which represents the publicly-traded timber sector. Then we create an “event period” that frames when Sandy might impact timber REIT stock prices. For this short-term study, we used an eleven-day period starting five trading days before the event and ending five trading days after the event. The table below summarizes the results. The estimated “Cumulative Abnormal Return” for the event window totaled -1.3%. For the five days following the event, the CAR totaled -0.8%. In sum, for this particular question and this particular timeframe, Sandy proved much ado about nothing.